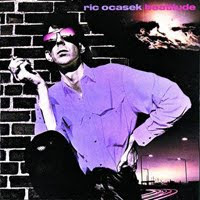 Ric Ocasek put out two solo records while The Cars were still together, and this is the first. Released between Shake It Up and Heartbeat City, I'd like to say that this album bridges the gap between those two, but it really doesn't. It sounds like a sparser version of The Cars, and while that's cool because it allows Ocasek's vocals to get more Lou Reed-y, the songs just aren't as strong, and definitely don't portend Ocasek penning the band's most commercially successful album in the few years that followed. Still, even if this album sounds like a collection of Cars B-sides, it's Ocasek in 1982, and that's pretty cool. The guy was a huge star at this point, and releasing a record that features as many disparate sounds as this one was pretty gutsy. "Something to Grab For" features the standard synth ploddings, but when a shredding guitar solo comes in, you'll never see it coming. Songs like "Prove" and "I Can't Wait" seem one little tweak away from being radio hits, but they never quite get there. The best track on this - or at least the most interesting - might be "Out of Control," the only song co-written with Cars bandmate and frequent collaborator Greg Hawkes. The synth lines are stacked, and hearing Ocasek fake-laugh at the beginning and say "fucked around" in the first verse is pretty sweet. The song is subdued, but lyrically, it's about as pissed as Ocasek gets and that's something. The more I listen to this album, the more I like it, and the more I realize I should probably shell out the two bucks for 1986's This Side of Paradise. Maybe I will.